Marcus Liefert is the Secretary of the Temple of the Waters. He has a Master's in Divinity from Starr-King Graduate Theological Union in Berkeley, CA. He currently resides in Vancouver where he co-leads a Unitarian Universalist congregation with his parter. Chuck Claire Bohman is the Board President of the Temple of the Waters. She holds a Master's Degree in Divinity in Spiritual Care and Liberation Theology. She has a background in Herbal Medicine and community organizing. She works as a chaplain at a public hospital and serves as an herbalist in the SF Bay Area, Ohlone territory. Lindsey Queue is the Treasurer and CFO of the Temple of the Waters. 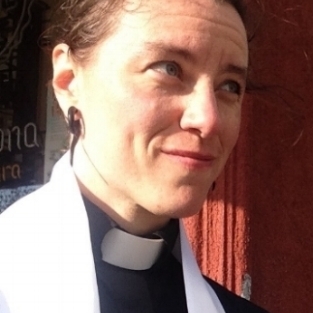 She has participated as a teacher in the Anne Braden anti-racism organizing classes of the Catalyst Project in the Bay Area and brings her skills as an organizer and trained librarian to the Temple. Iridaea MacAi-Bolger, or Dave, grew up in the Irish-Catholic diaspora in suburban Chicago. From his youngest years he was inspired by his mother's powerful faith in God, and hopes to walk a path that brings him into constant connection with that Being. His practice draws from Thich Nhat Hanh, the writings of Starhawk, the early Christians, and the practices of the Celtic monastics. Amara Hollow Bones finds the Sacred Mother in the rhythms of the wild. Tending wilderness landscapes, goat herding, practicing moon rites and seasonal observances - frequently covered in mud, leaves or blood - are ways they connect to that untamed mystery. Amara's blood roots are in the highlands of Scotland, and an itinerant path currently takes them between the Great Lakes region and the Klamath River area of northern California. Seneca's monastic practice exists at the intersection of reverence for the Sacred in nature and multi-cultural solidarity work. The earth cannot be well if its people are not well; people cannot be well unless our earth is well. In Seneca's practice, she seeks that place of divine receptivity where faith and love can find a vessel. The Gauls who loved Mary Magdalene are a particular inspiration. Rebecca always felt a Divine connection through the mysteries of nature buried deep and in plain sight in our forests, stars and oceans. Her practices dwelt on the honoring of water and of the great Mother, in all her forms. Rebecca’s ancestors come predominantly from Ireland and the Scottish Highlands. She joined them on the morning of August 11th, 2016, as the Perseid meteor shower graced the sky. She is missed; she is in everything.